As a new year rolls in, so predictably, I delve in the cellar for ten year old wines. The time span is arbitrary though it does feel like a neat circle and good test of South African wines’ – both white and red – ageability. Despite this motive, we usually drink most ageworthy white wines between four and six years, reds around eight years. 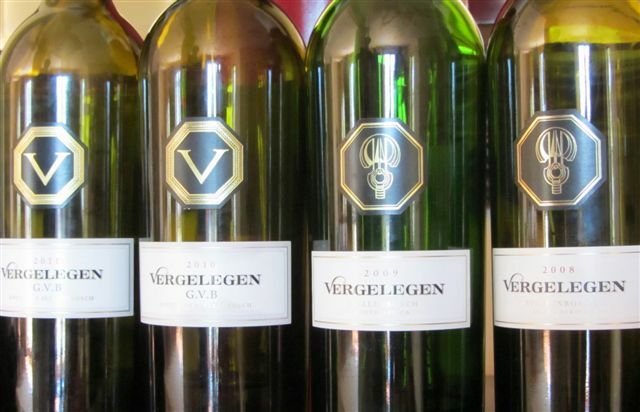 Smart packaging to match Vergelegen’s very smart flagship white, now labelled GVB. 05 carries the former badge, on the right. The first 2005 was more a spontaneous than planned withdrawal from the cellar. Friends had kindly given us two crayfish, which immediately suggested a Bordeaux-style, dry white with some age and a good dollop of semillon: Vergelegen 2005 caught my eye and was dispatched to the fridge for short chilling. This isn’t the sort of wine and age that should be served too cold, which would destroy its texture and mature flavours. Two and a quarter years later, that charm has dimmed a little; the wine still holds a remarkable colour (surely due to a good dose of free S02? ), the flavours, especially semillon’s waxy, truffly notes, are still enjoyably present but the juiciness and lively freshness are dimming, leaving a residual suggestion of heat. Casting analysis aside (anyway made on the left-overs the following day), the wine made a suitably grand accompaniment to the crays. With further improvement unlikely, I’d recommend opening and enjoying any remaining bottles. Reds, I hope will be another matter. I plan in due course to blind taste a selection with some friends. Reports will, of course, follow.